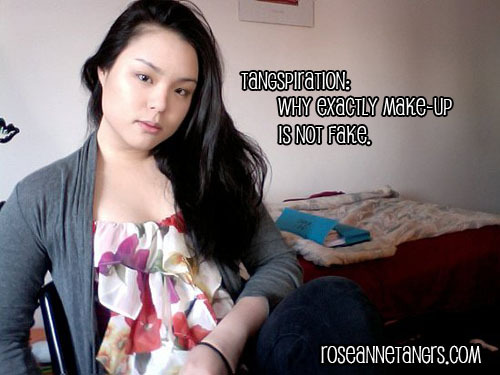 Tangspiration: Why Exactly Makeup is NOT fake. Today I thought I might write an opinion piece. I haven’t done one of these in a long time. Now, I’m going to warn you first that with opinion pieces, they’re unplanned and messy unlike most of my posts. There are no pictures, it’s just what I have to say about the topic at hand. Opinion pieces flow out of me and I’m not going to bother correcting and structuring it. We’ll see where we end up. When people come up to me and ask me what I blog about or what my passion is and I reply with the answer cosmetics or makeup, sometimes depending on the person, I get too much of a shrug or a raised eye-brow. When I asked people on twitter the remarks they get, @Miss_Flossy replied that “Someone once assumed I was dumb because I wear makeup.” Well hey, I get that too. You see, although I know that this does not apply to everyone, many seem to think that make-up or wearing make-up is fake. Albeit that yes, you are adding something to your face to enhance your beauty and that yes, it can sometimes become an addiction. Once you start to wear makeup, you can’t really stop. Well, for me at least. It is a rare occasion when I will walk out the door with a bare face. You kind of become accostomed to it and you kind of become comfortable under that shield of powder and foundation, that wonderful feeling of confidence in yourself that you know you look good because you have your “face” on. Maybe it’s the media. Maybe it’s the fact that all the popular girls on TV wear makeup and all the “real” girls tormented by these popular girls wearing makeup, don’t. Maybe it’s common instinct to defend the real girls and I’m not saying that wearing makeup is a necessity but maybe it’s that inner calling of a once tortured inner self that scorns makeup wearers alike. Whatever it is, most people who declare that makeup is fake often say that we don’t celebrate “true” beauty. But I guess the point today to address is well, what is “true” beauty? True beauty is internal. You could be Miss Universe but if you are rotten inside, mean, insiduous and horrible, and have slept with married men to get to where you are, I would never ever call you a beautiful person. Thus, whether someone is truly beautiful should be based on our values, kindness and mannerisms rather than our external apperance. I think that makeup helps us bring out our confidence, feelings of empowerment and control which ultimately aids to nurture our inner beauty. It helps to fix ourselves. Makeup should only act to enhance your appearance, not mask it either. Just like speech and art and poetry, makeup is a form of self expression. Each and everyone of us have different personalities and different styles. Just like clothes which can also enhance and alter our appearance, makeup does the same. Why isn’t wearing clothes fake? Why is makeup more fake than clothes? They both do the same thing. They express styles and it is ultimately and addition to your apperance. We may feel that clothing is necessary and makeup is not. Maybe that’s why. Like @Got_takoyaki, some also argue thatmakeup is an art form. The faces are the canvases and the makeup becomes the paint. War paint. Performance paint. Whatever paint, makeup is art. It is again a form of self-expression. I reckon there’s a deeper meaning to it though. Makeup might make us look better, but the reason why we do it is because it makes us feel better. @peachykeen_15 says that makeup helps her to be the best version of herself and that she wouldn’t be happy half doing anything in life, why stop at the way she presents herself. @Adeline_er says that makeup is used to enhance her natural features and hence isn’t fake as she hasn’t altered anything on her original face. I think however that ultimately, it all boils down to personal choice. When you look into the mirror and see yourself, do you believe that you’re beautiful? Well, imagine this. If you are undergoing cancer treatment, if you have been bullied again and again at school perhaps for the appearance of your skin, if you are facing ill treatment in the office because of how you look and you look at yourself in the mirror, it’s not going to be 100% there that you think that you’re hot. Most often than not, you don’t. You start hating yourself. You wish you were someone else. I think that no matter how many times people tell you that you’re beautiful, you will only think that you are beautiful if you yourself believes it. It’s the same with all the theories of life. But say that that cancer patient looks to her side table, grabs a brush and her favourite blush, the sweetest pink. Say she does. Say she careful opens up the package and takes the brush, sweeps it tentatively side to side and then looks into the mirror and in small strokes, applies the blush slowly, almost savoring the moment. When she is done, she looks into the mirror, turns her head side to side and smiles. She smiles. She hasn’t smiled in so long. She smiles because she feels better about herself. She feels more confident. She feels powerful. She feels beautiful. Let’s say she feels like she can take on the world. Would you come to her and point at her and laugh, “Haha, you’re fake now!” – I didn’t think so. Isn’t all that matters is if that a person is happy, that that person does what he or she wants to do, that makeup itself becomes a factor of personal choice rather than a factor of others. If putting that blush on makes her happy, so much happier, then let her put that blush on. A lot of people ask me why I ever started makeup or why I ever started blogging about beauty. I really was quite the nerd in High School. No silly person would have ever guessed, not even myself, that I would blog about beauty. I mean I always had that desire to be hot like all the popular girls but I wasn’t like them. They weren’t very nice anyway. All I really put on was an eye-liner and I would look into the mirror and tell myself, “Well, Roseanne, this is as good as it gets.” With a side smirk and a blank stare into the mirror and a comb through of my hair, I walked out of my room, ready to face the day no matter what people thought. I didn’t have time for myself. I barely cared about what I wanted or even how I looked. I had too many things to do and often those things were for other people. And then my heart broke. It broke into I remember telling my friend how it feels to be heartbroken. It feels like your heart is made of glass and it’s dropped from the top of the empire state building and crashes onto the pavement and the wounds feel like they’ve been swirled around in the desert and salted. Pain. You know, you hear and you see it in the movies. You see people get sad and heartbroken but you really only know when you’ve had it yourself and it’s a pain that you can’t just stop. It’s a pain that you ultimately have to rise up, defeat and learn from. I did. It’s something you have to do yourself, alone. I had never felt so alone in my life. Looking back, it feels like you’ve climbed mountains and crossed rivers and re-built buildings you never though you’d have to. I have to say that makeup to me was an integral part of the healing process. I started to wear makeup to school and in the morning I would wear makeup for myself. It was “me” time. It was the 10 to 15 minutes at the start of my day that would make me feel important again. Because when you break up with someone, you feel lost. You don’t know who you are anymore but makeup helped me feel powerful, in control and pretty. I felt pretty. I didn’t feel useless and pitiful, I felt pretty. That really helped me. Makeup isn’t fake. It isn’t about short, slutty skirts, mean cheerleaders, homewreckers or sell outs. I believe that sometimes we come to conclusions thinking we know both sides of the story but I don’t think we always do. It’s like thinking a toy does something when it actually does a bunch of other things that we didn’t know it did. Likewise makeup yes, if applied wrongly can be disastrous, but if applied correctly, can serve to empower women and that is something that I’ll always believe in. It’s about having pride in your appearance, respecting yourself as a woman. If I know I can present myself better with makeup, that I won’t be showing my blotchy face to others, then why not? This is a great opinion piece. I too look forward to the “me” time every morning. It’s a part of my daily ritual that helps me to face the day. It’s relaxing, it’s just you and the mirror. I like to add a little bit of colour to my face even when I’m home alone all day, and I think it’s fantastic to do so. ‘Makeup Time For Myself’ is definitely the most important part of the day for me. I’ve also had ‘friends’ who think lesser of people who blog about beauty and makeup. Why do these (ignorant) people think of those who blog about gadgets and whatnot as ‘smart’, ‘cool’, ‘IN’, but think of those who blog about makeup and beauty as ‘bimbo’, ‘shallow’, ‘vain’? To me, makeup is an art as much as IT a science. I love the part where you discussed about inner-beauty. Or actually the whole piece! The entire article is really convincing; not because of the literary devices you used i believe, but the your confidence that shines through out the whole article. I love reading your blog!! that pic of you is so gorgeous! what foundation were you wearing? I cannot agree more with your post. You put to words what I feel very strongly about. For me, it started off with me being a total tomboy. I abhorred skirts, makeup, my hair etc and my parents kept trying to ‘prettify’ me. My dad especially would tell how he wished my mum wore perfume and lipstick out. Then when I turned 16 my mum decided to get me my own basic set of makeup for prom instead of sending me to a makeup artist. I was in love with the edgy black smokey look then so I began searching online for makeup tips which led me to youtube. I still remember my first tutorial vid, Xsparkage’s black smokey eye. Long story short I feel like printing out your post and passing it around to all the haters lol. A woman’s beauty is not determined by her outer appearance but by her inner confidence she excludes. I like how you do not allow external criticisms affect you. Very inspirational and honest post Roseanne! As a male makeup artist, I’m judged all the time. Sometimes i even get hate from fellow female beauty workers. Sure, it isn’t the manliest job but i think its important. I remember my dad trying to get me into sports when i was younger but it just never worked; I preferred to watch my mum put on her lipstick. I think that makeup is a real job, and it’s not an easy or a glamourous one… anyone who’s been on a fashion set behind the scenes will know what i mean. It’s highly competitive, you have to keep on trends, you have to please everybody and keep a smile on your face while doing it. It’s not easy. But I wouldn’t do anything else. I get to make people feel better about themselves, make them feel empowered and see them blossom in the space of an hour. I’d like to see a sportsman say that about their job. Really your excellent picture like a heroin attracted me as your good fan. Actually i like you as a friend. Do you agree? I concur with every opinion you have shared about makeups girl. I particularly feel more beautiful when I put makup on, though some people will tell me that I am just as beautiful even without it. I agree, wearing makeup doesn’t mean you’re fake. And it is like wearing clothes. You don’t go out in public all scruffy-looking and wearing PJs. You go out looking presentable. You owe it to yourself and other people. That was a very beautiful post, and, in actuality, really touched me because, that is the same way I stumbled into makeup. I too used to be very flippant about how I looked and what people perceived me as visually. Then, one of my exes really really hurt me in how we separated and around that same time I discovered beauty bloggers on youtube. It really changed my life and my perception on beauty. More importantly, it changed the way I used beauty products to pamper and heal my wounds. I threw away almost all my makeup in a fit when I realized it but, recently, I have come back around to the fact that it makes me feel empowered and how should that be bad. So thank you for your heart to heart. I want to let you know it was wonderful and, you have a kind soul.